Finland is now in a position to lead on continued support to education for displaced children to ensure a more peaceful world. Finland is also in a unique position to more actively connect education in emergencies with vocational education – the two must go together if we are to break the vicious circle of displacement and disparity. Each year in November, the World gets its school report card. This year is no exception. The 400 page long Global Education Monitoring Report (GEM) from UNESCO in Paris has collected data and analysis on where each country is on its way to meeting the Sustainable Development Goal number 4 (SDG4) on education and development. Although the world overall gets better and more coordinated at meeting the many challenges, the report also reveals how far we still are behind the goals, and the amount of work needed over the next decade to be where we want to be in 2030. The report looks at all countries, analysing their data on school systems and education financing. It focuses both on the countries that provide aid assistance to education and those receiving it. Finland has the means and the technical know-how to do so, and this would not only help ensure the right to quality education. It would also contribute to a much more stable world in an age of mass displacement and in a reality where the gap in transition to secondary education is especially large for refugee children and where few have the right skills to enter the labour market and therefore break out of a vicious circle of displacement and disparity. Because displacement is the great issue: Each year, the GEM report has a specific theme. This year it is on an urgent and globally rising challenge: Migration, displacement and education – Building bridges, not walls. The report sets out the challenges with this large and growing population, and maps trends and debates on how progress is made, providing the international community with recommendations. This is especially important for Finn Church Aid (FCA), because we work in some of the most difficult country contexts, where refugees and displaced persons are a major part of the population we try to assist. Uganda has one of the world’s largest refugee populations as well as one of the most progressive policies on rights for displaced persons. Myanmar on the other hand has forced more than 700 000 people across the border into Bangladesh, a country which is understandably weary of integrating such a large new population into already fragile national systems. In Somalia and Eritrea a lot of people are either internally displaced or they left their home country after years of unrest or challenging political situation. FCA works with education in all of these countries. Today’s crises are long and protracted, resulting in extensive periods of displacement and disruption. Because of this and a range of policy and financial barriers that may prevent refugees from accessing national education systems, displaced populations are five times less likely to attend school than other children and youth. UNHCR estimates that only 61% of refugees attend primary school, compared to 91% at the global level. 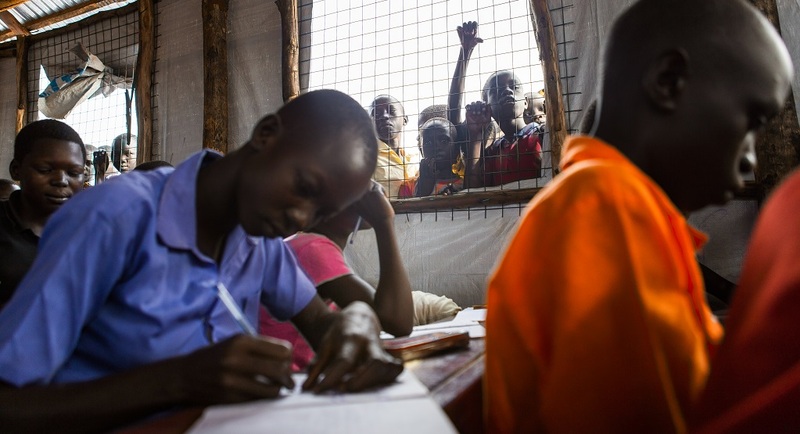 Only 22% refugee adolescents receive a secondary education, compared to 84% around the world. The new GEM report goes on to make the all-important link between ensuring the right to education for displaced populations and achieving the wider SDG4 goal for development. A major recommendation is for the inclusion of refugee children into national systems of the host countries – of which most are in the Global South, such as countries like Uganda and Bangladesh. This is the best and most sustainable way forward to ensure quality education and avoid creating large parallel societies or refugee camps, in which people are caught for years and years with neither hope of going home nor integrating into the host countries. Without integration and hope, there is a very real danger that war and instability continue and spread. Unfortunately, there is still a lack of political will for addressing this issue. Only a little more than half of the 25 refugee host countries, who according to UNHCR have the biggest populations and needs, actually allow refugees to integrate into national systems. One country that is on the forefront is Uganda, which for instance allows refugees from Chad, DRC and South Sudan the freedom of movement and gives them a piece of land, among other things. This is in part due to a far-sighted regional collaboration of seven East African countries that have come together on a commitment to inclusion in education, as expressed in the Djibouti Declaration. However, what is needed in Uganda, and in the many other countries that draw up impressive policies, is a greater support from the international community, better accountability and improved monitoring systems to prove that the good intentions are actually translated into action rather than just staying at a policy level. Finland and its EU partners can help support and encourage the host countries to do so through collective and coordinated political and financial action, as well as through technical support on key issues like the important connection between education, youth and the labour market in the host countries.